This is for Ruthie (and anyone else who enjoys making candy). In the comments last week, Ruthie said she buys English Toffee locally for about $16 per pound. My cost per pound is a fraction of that. I did the math at the bottom of this post. Ruthie, enjoy! A good friend of mine has a sister-in-law who is a local chocolatier. When my friend expressed interest in making some candy at home, her sister-in-law gave her this recipe. The is the full recipe. It makes about 3 1/2 pounds of candy (good for giving gifts, not so good for my waistline). I make a half recipe when it's just for my family. Next time, I plan on making a quarter recipe. It's simple, just 4 ingredients -- granulated sugar, salted butter (not unsalted and definitely not margarine), almonds, and milk chocolate (the better the quality of chocolate, the better the quality of the finished product, just sayin'). Lightly butter the jelly roll pan. Sprinkle half of the chopped nuts over the bottom of the pan. Sprinkle half of the finely chopped chocolate over the nuts. Set aside. In a medium-sized saucepan, melt the butter with the sugar. Cook to 300 degrees F, stirring constantly. When it reaches 300 degrees F, remove from heat. Quickly pour the cooked butter and sugar over the layers in the prepared jelly roll pan. Sprinkle with the remaining chocolate and spread to the edges of the toffee with a knife or off-set spatula. Sprinkle with remaining nuts. Cool. Break into pieces. Store in an airtight tin. Keeps for about a week at room temperature, but a month in the fridge. Since gifts are largely about presentation, I think this looks nice, one of two ways, when given as a gift. Either in a single, large chunk per box or tin, wrapped in a large sheet of parchment inside the box, or, if broken into single-serving bites, in mini-muffins liners or candy paper cups, as you'd find in a box of chocolates. 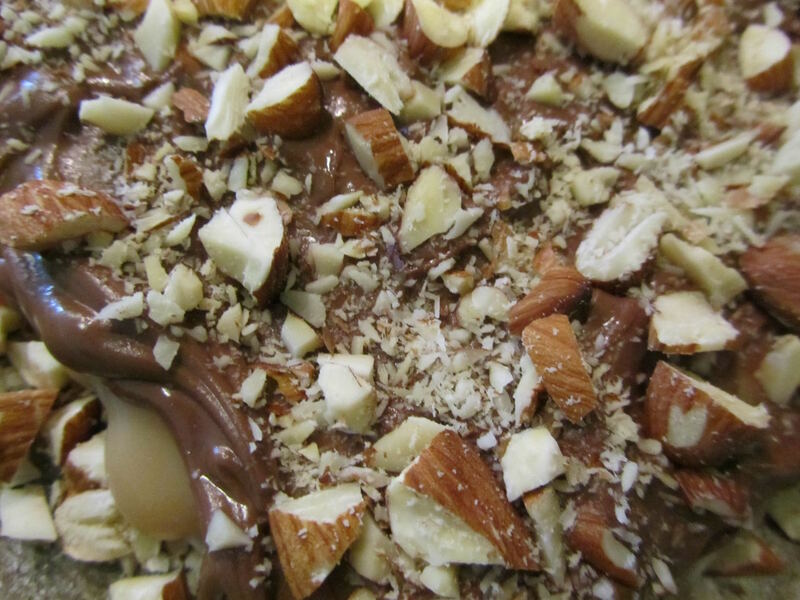 Yum, what's not to love about a combination of butter, sugar, chocolate and almonds?! I make a version of toffee every year at Christmastime and it is definitely a favorite of all those who receive it. I will make your recipe next time as it seems like a less time consuming one. I hope you enjoy this recipe. It has a nice texture to it, and it's quick to make. Oh, yum. I think it's best for me not to know about such delicious recipes. ;) I like your presentation ideas--presentation isn't my strong point! While I *say* I made this for the family, in truth it was one daughter and I fighting for every last scrap of it! Hence the need to make a quarter-batch next time! But it does make a very appreciated gift at the holidays (when everyone feels adequately covered up in bulky sweaters). I'll take a piece! I like only just a little bit of that stuff and that's about it. However, my family would devour that in about half an hour. Same with ice cream and other desserts. My dad loves ice cream and is fairly picky about brands and I grew up having ice cream at night and dad always did the scooping but I'm not crazy about it now. I would much rather have chips or something savory. My kids have their grandfather's genes because they love ice cream and sweets. One daughter and I have significant sweet tooths. It's hard for us to have sweet treats in the house, and not gobble them up. I wonder if this is genetic? So yummy...rich, homemade chocolate candy!! This reminds me of Almond Roca, my husband's favorite candy. Maybe I could make this for his birthday next month. Thank you for your recipe and tutorial. My friend, who gave me this recipe, calls it Almond Roca. Just an interesting (or not interesting, however you view it) piece of info -- Almond Roca is made by Brown & Haley, a PNW company (Tacoma, just south of Seattle). Some folks in the state legislature, here, have tried a couple of times to make Almond Roca the official state candy of Washington state. Your husband is a lucky man, if you make him some of this for his birthday! You're welcome, and enjoy! Does the milk chocolate have to be the baking pieces kind, or can I use milk chocolate candy bars? Also, does the almonds have to be roasted? the milk chocolate can be any real chocolate (really cheap cocoa flavored candy doesn't melt easily). My friend uses Hershey bars when she doesn't have leftover scraps of the good stuff from her chocolatier sister-in-law. I do a per pound, price comparison on the chocolate, chips vs bars. Just make sure to chop the bars, fine. This matters most on the under layer, as you won't be smoothing the chocolate with a knife underneath the toffee, as you will on top of the toffee. I've done it both with roasted almonds and without roasting. The recipe doesn't specify, But I think mild-roasting brings out the flavor of the almonds. I tend to roast the chopped almonds when making for a gift, as I want everything to be just right. And you do taste the almonds more when roasting them. Good luck! Do you have a candy thermometer? Or other thermometer which goes to 300 degrees F? I don't think I have, since I don't recall ever using one. But I'm beginning to have memory glitches, so I better look around before buying. Is the exact temperature very important? I have never tried making candy before. YHF, If you have any kind of instant read thermometer that goes up to 300 degrees F, that would work. I use the same thermometer that I use for making yogurt, and cooking meat. My friend makes this without a thermometer, so it is doable. She goes by smell and color, she has made this so often. But I would think the cold water test would work, also. It's just not very exact. There's a point where the mixture can separate. I've heard of this happening if you overcook (like if you cook to 320 instead of 300). My saucepan has a heavy bottom, and conducts heat uniformly. And I cook the mixture over Medium, stirring the entire time. I've never had separation occur, so far. Pick a day when it's not too humid, too. I've heard humidity is hard on candy-making. I'm going to copy and save in my recipe book. I don't have many of the ingredients, even the butter we have is the unsalted kind. No almonds in the house either. I hope I can buy these ingredients at a good price before my husband's birthday a month from now. Good luck, YHF! Your husband will love this. I agree with Mary. What's not to love in this simple combination of ingredients. I would have to make this with the intention of giving it away, or I would probably eat it all. I can only make this when there are others in the family around, often enough, to help me eat this. Otherwise, I will eat all of it! But I am thinking about making just the toffee part, to break up and use in toffee ice cream this summer. Maybe without the chocolate I won't eat the whole thing? This sounds like an experiment I should try. Mmm! I was also thinking of Almond Roca as someone else mentioned above. Love the stuff! This is probably something I shouldn't have in the house right now, but will sure have to try it for the holidays! I know, not exactly swimsuit-friendly, is it?! It is good, though!